Is My Spouse an Alcoholic? When Should You Leave the Marriage? Living with a spouse or a partner who abuses alcohol can be incredibly difficult and even frightening. You may not be sure whether the person’s drinking is a serious problem or not, or how to get help if the drinking is disrupting the lives of you and your children. The terms “alcoholic” and “alcoholism” are becoming less frequently used as clinical terms and, in some cases, can interfere with the treatment and understanding of alcohol problems. The term “alcohol use disorder” is used in this article to describe issues ranging from alcohol abuse to a severe addiction to alcohol. Learn more about the use of alcoholic and alcoholism. An alcohol use disorder is a clinical disorder that is associated with the dysfunctional use of alcohol. The use of alcohol can impact the person’s life in a number of areas including his or her occupational functioning, social life and relationships, emotional and psychological functioning, and even his or her physical health. 1 The disorder can range from mild to severe. Who Answers? anytime to speak to a recovery support specialist. Consistently drinking more alcohol or drinking for longer periods of time than originally intended. Consistently experiencing strong desires or urges (cravings) to drink alcohol. Having a number of failed attempts to cut down or control drinking, or having a persistent desire to cut down or control alcohol use and being unable to do so. Being unable to fulfill important obligations, such as obligations at work, school and at home due to alcohol use. Spending a great deal of time using alcohol, trying to get alcohol or recovering from alcohol use. Giving up or significantly cutting down involvement in certain activities that were once important, including activities related to work, relationships or recreation. Continuing to drink alcohol despite having significant problems due to alcohol use. Repeatedly drinking alcohol in situations where it is dangerous to do so. Showing tolerance to alcohol or needing to use more alcohol to achieve the same effects that were experienced earlier at smaller amounts. Displaying withdrawal symptoms when cutting down on alcohol use or stopping altogether. Remember that only an addiction professional or a licensed and qualified mental health worker can diagnose an alcohol use disorder. Being secretive about alcohol use. Consuming more than 5 alcoholic beverages on the same occasion more than once a week. Drinking that results in marital strife or in failing to meet obligations at home, such as taking care of children and doing chores around the house. Getting very defensive or even angry and hostile when confronted about alcohol use. Consistently showing up to important functions either intoxicated or hungover. Showing a sudden lack of interest in work or other types of previously important activities. Frequently complaining about not feeling well, including having headaches, nausea and lacking energy. Spending quite a bit of time in places where alcohol is sold – especially bars or lounges. Drinking to cope with stress or with other issues. Discovering empty or partially used alcohol containers in the person’s room, car and other places. Suffering legal consequences as a result of alcohol use, such as having more than one ticket for driving under the influence of alcohol. A person does not have to suffer withdrawal symptoms when he or she stops using alcohol in order to be diagnosed with a severe alcohol use disorder. A person does not have to drink every day. Some people with very severe alcohol use disorders may drink alcohol only once or twice a week. A person does not have to have the desire to drink every day. 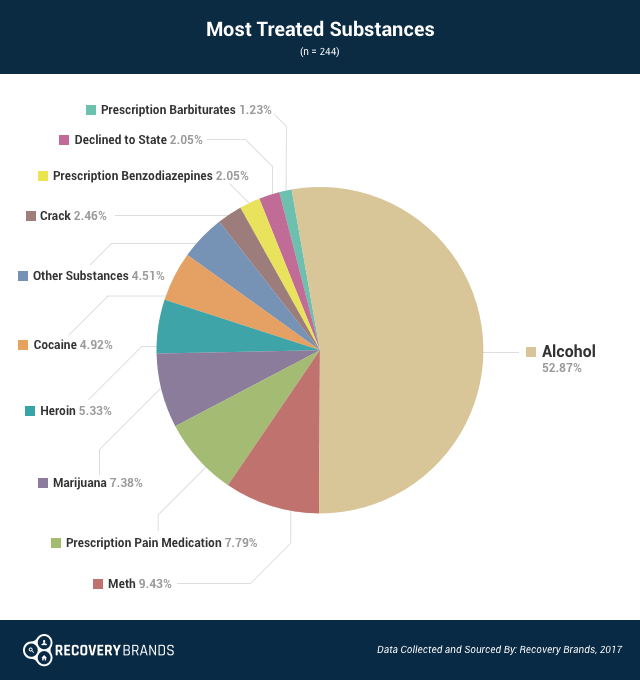 Alcohol is one of the top abused substances among treatment attendees, according to a 2017 Recovery Brands survey. Nearly 70% of survey respondents struggled with alcohol abuse, and almost 53% of people cited alcohol as the substance that they received the most treatment for. Who Answers? to begin recovering today. Approaching someone who has an alcohol use disorder is always a delicate situation. The person may deny that he or she has a problem and may become very defensive and angry. Therefore, try to limit anger, hostility or confrontation when talking to the person. Never discuss the issue when the person is intoxicated or has been drinking. Wait until he or she sobers up. Discuss the issue when the person is recovering from substance use. People who are hungover tend to be more receptive to discussing their behaviors. Talk to someone who has treated substance use disorders. This can include a licensed therapist or someone who has been in recovery and attends support groups, such as Alcoholics Anonymous. Ask for that person’s advice and incorporate what you can. Do not approach the person when you are angry. Wait until you calm down. Try not to be confrontational. Do not accuse the person or try to shame or embarrass the person. Keep the conversation as private as possible. Avoid places where alcohol is available. Point out the facts as you see them. This means not embellishing issues and not assuming things based on certain behaviors. Instead, point out what you have observed. Don’t rely on what other people have told you unless you have one of those people with you (such as in an intervention – see below). Explain how the person’s behavior affects you. If there are children involved, you can point out how the person’s behavior affects the children. Be prepared to offer at least three different options for treatment. These should be totally different options, such as attending Alcoholics Anonymous (you can even offer to attend a meeting with the person), having an assessment done by a therapist, having him or her go with you to see a therapist or going to see an addiction medicine physician. Do not offer the person three options that involve the exact same thing, such as attending three Alcoholics Anonymous meetings. Above all, offer support, be caring and be concerned. If the person becomes aggressive or hostile, stop the conversation and try again later. If the person continues to be resistant, consider an intervention (see below). Never talk to the person when he or she is intoxicated. Never get into a shouting match or argue with the person. Never attempt to blame or shame the person. Don’t make excuses for the person’s behavior or why he or she is drinking. Who Answers? to speak with a treatment support specialist who can provide alcohol recovery options in your area based on your insurance. 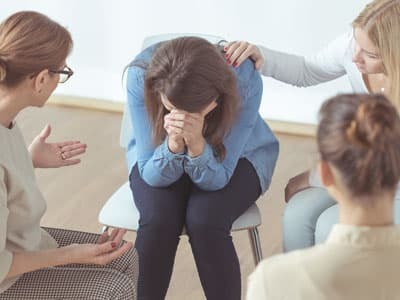 Inpatient: Inpatient or residential treatment programs are live-in programs that include detox, individual and group therapy, aftercare and, often, 12-step meetings. They are best-suited for people with severe alcohol use disorders who need to detox under medical supervision, or people who are struggling with a co-occurring mental health condition, such as depression or PTSD. Outpatient: Outpatient programs involve visiting a treatment center on certain days of the week for a certain number of hours at a time. They allow participants to continue to live at home and take care of work and family responsibilities. Some may offer detox, but they do not offer the same level of care as inpatient programs. 12-step meetings: Many people in recovery from an alcohol use disorder attend 12-step meetings such as Alcoholics Anonymous (AA) when they complete a formal treatment program. Some may use AA as their primary form of treatment, but the program does not offer detox, medical supervision or professional therapy. The meetings are run by people in recovery and offer a structured, step-by-step process for achieving and maintaining abstinence from alcohol. Non-12-step meetings: Other programs, such as Rational Recovery, SMART Recovery and Secular Organizations for Sobriety are alternatives to the more spiritually based 12-step groups, such as Alcoholics Anonymous. These groups can be sources of long-term assistance in recovery and can lead to the development of new relationships that foster recovery. Family therapy/counseling: Research suggests that family therapy is useful in the treatment of substance use disorders in adults and adolescents. 4 Family therapy involves sessions with the substance user and at least one member of his or her family. The sessions can include education about addiction and discussion of behaviors that may be contributing to the addiction and ways to address these. Medication-assisted treatment: This option may be used during and after the detoxification process, and only a licensed physician can deliver this type of treatment. This option is essential for people who have moderate and severe alcohol use disorders. A physician may also combine medications such as disulfiram (Antabuse), acamprosate, and naltrexone with behavioral interventions after the detox process. An intervention is a process to try to get a person with a substance use disorder into treatment. 4 During an intervention, family members, close friends, close coworkers and others confront the person in a nonthreatening manner. The group members discuss how the person’s behaviors affect them and voice their concerns about the person’s substance use disorder. This is often a last-ditch effort aimed at trying to get a person who has a severe substance use disorder to realize the consequences of his or her behavior and the need to change. Interventions are more likely to be successful if the group meets ahead of time, plans how to approach the person and recruits a professional intervention specialist or a licensed mental health care worker who specializes in addiction. This person can provide advice during the planning stages and can even attend, if not direct the intervention. Only people who are very close to the person should be involved. No friends of friends or distant coworkers should be included – only people who have close personal relationships with the person (this does not apply to the professional therapist or intervention specialist). Interventions aren’t successful if they are confrontational and coercive. The goal is to express concern, point out facts about the person’s behavior, discuss how the person’s drinking affects the group members and offer assistance in finding treatment. Expressing anger and accusing the person often backfires. While interventions should not be coercive, there can be consequences for not seeking treatment. This depends on the particular issues involved. For example, someone with a severe alcohol use disorder who is neglecting his or her children could have the children taken away if he or she does not seek treatment immediately. A supervisor at the person’s job could also discuss the consequences of continued alcohol use in the workplace. Despite the well-intentioned nature of interventions, very little research supports their effectiveness. In addition, existing research does not indicate that they are significantly more successful than other forms of treatment. 5 Nonetheless, interventions can be a way to communicate concerns about a person’s alcohol use and may help get the person into treatment. Al-Anon helps people who are in relationships with substance abusers. Dealing with a family member who has a substance use disorder can be quite devastating. Spouses should avoid blaming themselves for their husband’s or wife’s alcohol problem. While it’s important to try to help one’s spouse, you cannot be responsible for the choices that person makes. Support groups, such as Al-Anon, specialize in working with people who are in relationships with substance abusers. Anyone dealing with a spouse who has a substance use disorder should consider attending at least one of these groups to decide if they can be helpful. Members in these groups can also offer advice based on their experience that can be very useful. Some therapists also specialize in treating codependency issues. Anyone can find a therapist in his or her area and have an initial consultation to decide if he or she wishes to enter counseling. Codependency is not a clinical term, but a term used to describe issues that often occur when relationships become dysfunctional. Feeling responsible for someone who has the capability of being responsible for himself or herself. Having poor boundaries – the person defines himself or herself in terms of relationships as opposed to personal qualities. Feeling that pleasing a partner is the only option in the relationship. A consistent fear of being rejected or not pleasing or helping one’s partner. If He's the Alcoholic, Why Do I Need Help? The spouse of a chronic drinker can greatly benefit from support systems and self-care. Groups such as Al-Anon and Co-Dependents Anonymous offer the opportunity to share experiences and begin to focus on your own life. Recovery from an alcohol use disorder is a long-term commitment. It is not like having the flu or pneumonia, getting treatment, and then being cured. The person in recovery will need to continue some type of long-term aftercare program, such as participation in 12-step meetings, continued participation in group or individual therapy or some other activity focused on maintaining recovery. The recovery process can be exciting and stressful at the same time. The recovering person and his or her family will have to make adjustments and try to change situations that fostered the person’s substance use disorder. Even people who make a commitment to recovery, enter treatment, do everything right, and are successful in the initial stages of treatment often have relatively high rates of relapse. Recovery is trial and error. Relapse should be considered an opportunity to learn and begin again as opposed to the person being a failure. The best thing one’s spouse can do is offer support and understanding. At the same time, be firm and point out issues that may be associated with relapse. Any type of abuse to the spouse or one’s children. This includes verbal, physical and sexual abuse. Separating from a spouse in these instances is not necessarily the same thing as giving up on him or her or breaking up. Instead, it is a move designed to protect the safety of the family. Any other situation that is potentially dangerous and is a result of the spouse’s behavior or alcohol use disorder. Again, this is a move designed to protect the safety of innocent people. Spouses who are habitually unfaithful. This is a very delicate situation. The spouse has to decide what he or she can tolerate regarding fidelity. Spouses who threaten to bring the family into financial ruin. In these instances, get an attorney and sort out the issues so that you can maintain some level of independence. Deciding how much emotional hardship you can endure is difficult. But sometimes separation from a spouse with a substance use disorder allows both parties to get a better perspective. How Do I Get Treatment for My Spouse if We Don’t Have Insurance? See if you qualify for Medicaid, a government-sponsored insurance program that covers some forms of substance abuse treatment. Some treatment programs also offer payment programs for treatment or offer payment on a sliding scale based on income. Contact treatment programs in your area and see if they offer these options. In addition, getting involved in 12-step groups, such as Alcoholics Anonymous, is essentially free. These programs are funded by donations, and attendees typically donate a dollar at every meeting. However, you don’t have to donate if you don’t want to. How Do I Help My Spouse Who Has PTSD and Alcoholism? Someone who has co-occurring disorders or a dual diagnosis (a substance use disorder and another psychological disorder) should receive treatment for both of them at the same time. You may find, however, that it is easier to talk with your spouse about getting treatment for his or her PTSD. During the assessment process, the clinician will screen for the presence of substance use disorders. If you can be part of the initial interview and assessment process, you can mention the alcohol problem to the person doing the assessment. What Do You Do if the Person Doesn’t Want Help? You can stage an intervention (see above) and get as many close friends and relatives involved as possible. This can help the person understand that there might be a problem with his or her alcohol use. Other alternatives include laying out specific consequences for your spouse for not engaging in some form of treatment or at least in an initial assessment. Research indicates that participation in treatment does not have to be voluntary for it to be successful – though it is ideal to have the person voluntarily engage in treatment. They are not clinical terms. While the terms “alcoholism” or “alcoholic” are still commonly used, their meanings are vague, and they are not clinical terms. They no longer refer to any type of diagnostic category. In addition, these terms are subjective as opposed to being based on observable signs and symptoms. For example, many people who hear the term alcoholic think of a stereotypic skid-row-type of drunk. But people in 12-step groups, such as Alcoholics Anonymous, may describe themselves as “alcoholics” and yet some would not meet the diagnostic criteria for a severe or even moderate alcohol use disorder. Moreover, confronting someone and calling him or her an alcoholic is bound to stir up defensive reactions. Even thinking that a person is an alcoholic is often associated with a number of interpretations, which may or may not be accurate about that person. If you think you or someone you know may have an alcohol use disorder, call 1-888-319-2606 Who Answers? for information on rehabilitation programs. A treatment support specialist can confirm your insurance over the phone. If you don’t have insurance, call the Substance Abuse and Mental Health Services Administration’s (SAMHSA) toll-free helpline at 1-800-662-HELP (4357).
. American Psychiatric Association. (2013). Diagnostic and Statistical Manual of Mental Disorders, Fifth Edition. Washington, D.C.
. Watson, R. (Ed.). (2012). Drug and Alcohol Abuse Prevention (Vol. 1). New York: Springer Science & Business Media.
. Ashery, R. S., Robertson, E. B., & Kumpfer, K. L. (Eds.). (1998). Drug Abuse Prevention through Family Interventions (Vol. 177). Rockville MD: DIANE Publishing.
. Loneck, B., Garrett, J. A., & Banks, S. M. (1996). The Johnson Intervention and Relapse during Outpatient Treatment The American Journal of Drug and Alcohol Abuse 22(3), 363-375.